Staples has announced that sales were down last year, and as a result they plan to close 225 stores by the end of 2015. The office supply company released their quarterly and annual earnings report this morning and the picture isn’t terribly rosy for Staples stockholders or its employees. Staples's retail and online sales totaled $23.1 billion in 2013, down more than $1.2 billion from 2012. Even when you factor out the extra week in fiscal year 2012 in that the 2013, Staples's revenue for 2013 was still down 3.4% ($800 million). Part of that decrease can be blamed on the Staples stores that were shut down during 2013, but even then sales were down 2% in 2013 when compared to 2012. As a result of the decreasing sales, Staples has announced plans to cut cost by closing under-performing stores. And since most of the drop in revenue can be attributed to Staples's NA stores ($700 million, in fact), they'll be the first to go. The company plans to close up to 225 stores in North America by the end of 2015. Staples has also initiated a multi-year cost savings plan which is expected to generate pre-tax cost savings of approximately $500 million a year by the end of 2015. So what does this have to do with Barnes & Noble? Remember last January when B&N let slip that they plan shutter 20 stores a year for the next decade? A story in the WSJ caused a shitstorm of negative press in the blogosphere when a senior manager revealed B&N had plans to shrink for the next decade. At the time it seemed reasonable to freak out over the news, but in light of recent news from other retailers I think it might have been a mistake. After Tuesday's news about Radio Shack and today's news about Staples, I think we may have over reacted to the report. I still think B&N should not have let that remark slip, not given the holiday season they had just had, but in their defense it now appears to have been blown out of proportion. That B&N story about the store closings was totally overblown. The market misunderstood what was an ordinary statement an executive made about routine store turnover. They were closing 20 stores a year, but they were also going to open some stores too; he wasn’t making any kind of statement about what their net footprint was going to be. Don’t be so quick to backtrack. The office supply business is in a similar position as bookstores, but worse. Not only is amazon eating a good chunk of their business, so are the warehouse clubs like Sam’s and Costco. And OfficeMax and Office Depot recently merged to increase their competitiveness against Staples. So Staples doing a big retrenching is having the guts to accept they are in deep doo-doo and need drastic action. So in other words Staples has committed to surgical intervention while B&N is has chosen to slowly bleed to death? I didn’t know Office Max/Depot was still in business. I wrote them off out-of-business years ago. I predict far more B&N stores will be closing than the latest guidance indicated and they will be more in line with what we are seeing at Staples and RadioShack. There is simply far too much retail (and shopping malls) scattered around the country in the Internet shopping age. I know brick and mortar still accounts for the bulk when you include clothing but for consumer electronics, software, books, photos, movies retail will likely fall faster than many expect. Anyway, that is just one person’s prediction and I have no inside information. I did see it with Circuit City, CompUSA, and others though. Hope I’m wrong. Contra Nate, B&N did not have a bad holiday season. I just want to point out to all of you that though B&N comparable store sales declined 4.9 percent this most recent quarter, most of the decline was due to NOOK sales. 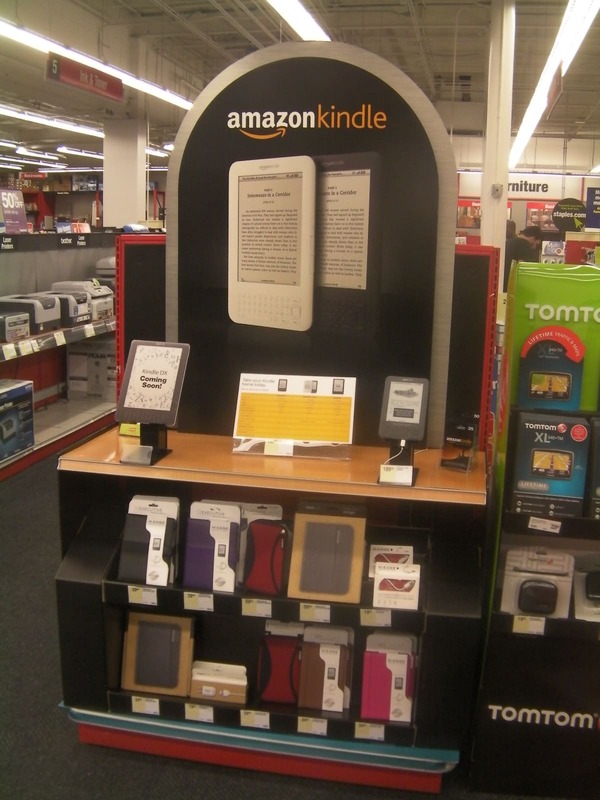 When you exclude NOOK device and accessory sales, comparable store sales declined 0.5 percent. Those are not bad results, which is why the stock price is up. Hi Steve, yes I did see those B&N results for comp stores. But I also saw that the product mix continues to move away from books, which has been going on in bookstores for several decades now. Cards, magazines, etc. And then the overall book sales produced by the chain continues to decline as they close stores. I just do not see the superstore surviving for books but indies will hang on and improve over the short term. Could well be wrong. 1) Books are less fungible than other goods. One book that is $10.00 is not the same as another book that is $10.00 except on an accountant’s balance sheet. With literally tens of thousands of new titles appearing every year, this makes connecting the right book with the right reader a peculiarly complicated task. Of course, there is show rooming going on. I won’t deny that; but I want to point out that while it is possible for Amazon to steal the customers away from the bookstore just before they’re about to make their purchase, the customers are still in the store looking to make a purchase. The store still has the advantage if they can capitalize on it. It takes a sizable price differential to overcome that. I mean if I have the book in my hand, how much lower does the price have to be before I decide I’m willing to delay gratification for a few days to save a few dollars? The convenience of having what I want now versus later is worth a certain premium The discount would have to be substantial to induce a consumer to wait. Books are not big ticket items for the most part. A 10 % price differential means a lot if you’re buying a $200 good, but much less if you’re buying a $15 one. To sum up, bookstores will continue to survive because bookstores are still the best places for readers to go to discover new books. This ensures traffic. And while there will be showrooming going on, I will argue (from the above reason) that the effect for the booktrade is relatively limited. They don’t need to match the price, just so long as they are in the ballpark, competitive. 2) The importance of books to book discovery, connecting readers to the books they want, leaves bookstores with another avenue towards making money if all else fails. Bookstores could theoretically turn to monetizing their display spaces. Think of it this way. Though Amazon is increasingly powerful in the marketplace, it still has not been able to turn its own books published under its own imprints into big hits, and not for lack of trying either. once bookstores, almost without exception, B&N, Books-a-Million and the indies, shut their titles out, it became a forgone conclusion. If nothing else it demonstrates the marketing power brick and mortar bookstores still have to make or break certain titles. And therein, from my point of view, lies an enormous financial opportunity for bookstores, to sell their access to consumers to the highest bidder. Why not treat store displays like TV air time, or billboard space, or any other marketing space? Make the big five publishers pay for it.